If I understand it correctly - the 16GB one would be ‘free’ and you would have to pay 4,725 yen a month for the 24 month contract. 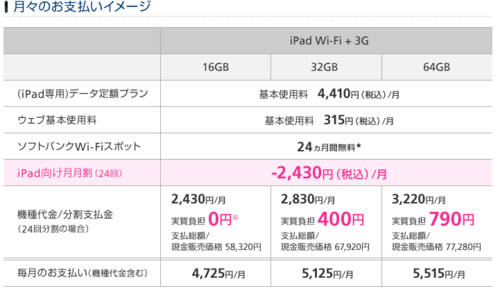 The cost of buying the cheapest iPad directly from Apple is 48,000 yen so the maths works out at 113,400 yen minus 48,000 yen meaning that the 3G access costs 65,400 yen (2,725 yen per month). Apologies if the mathematics are wrong - not my strong point. I think if I didn’t already have an iPhone this would be a vary attractive option. Probably one reason for the deal is that iPad version two will come earlier rather than later next year. So you would be buying a model that soon would be upgraded. But an iPad would be really useful for anyone studying English or Japanese or any other languages for that matter.